Fleet Maintenance Pro Shop Edition makes it easy to track preventive and repair maintenance on your fleet. Automated and color-coded alerts instantly show you which vehicles and equipment are due for service. Designed especially for shops, you can track repairs, generate work orders, and track parts inventory. Use the fleet history to monitor PM, repairs, parts, labor, and operating costs. Track vendors, fuel, drivers, registrations, and more. The Shop Edition is specifically designed for companies that perform most of their maintenance internally. 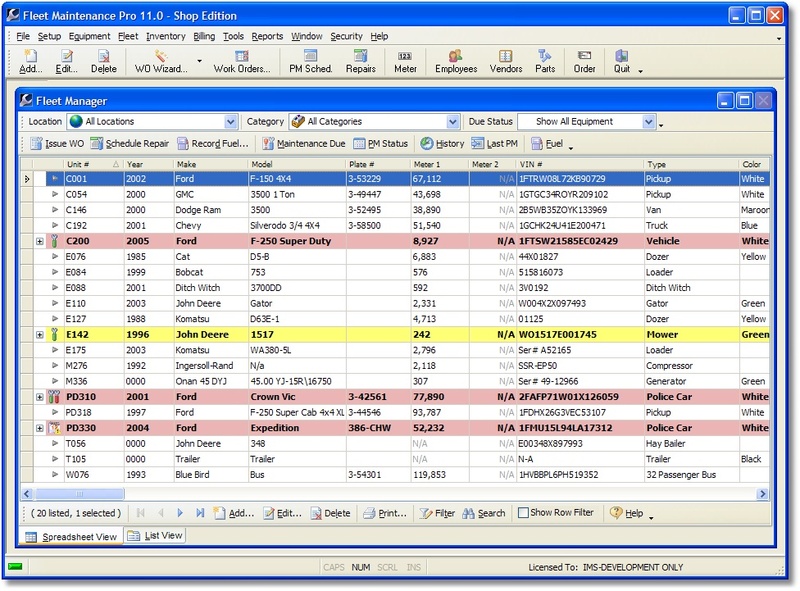 The Shop Edition provides features such as work order management, automatic work order generation, parts inventory, purchase orders, invoicing, customer tracking, and provides the ability to assign parts to PM services to simplify data entry. Tracks and organizes preventive maintenance for home vehicles and/or equipment. Easy to use universal maintenance mgmt software. Track any type of object. Manage all your passwords and websites with the ability to auto-fill passwords. Qweas is providing links to Fleet Maintenance Pro Shop Edition 11.0.0.40 as a courtesy, and makes no representations regarding Fleet Maintenance Pro Shop Edition or any other applications or any information related thereto. Any questions, complaints or claims regarding this application Fleet Maintenance Pro Shop Edition 11.0.0.40 must be directed to the appropriate software vendor. You may click the publisher link of Fleet Maintenance Pro Shop Edition on the top of this page to get more details about the vendor.